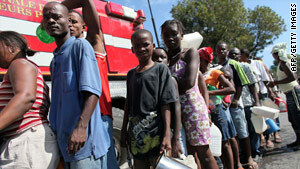 Haiti quake survivors line up to get water from a fire truck. (CNN) -- As the world looks for ways to help the victims of Haiti's earthquake, the FBI is now warning that there are also those who are looking for opportunities set up scams surrounding the latest disaster relief efforts. The FBI advises that people should be very skeptical of any unsolicited appeals they receive or find on the Internet. One month after Hurricane Katrina, the FBI said it was suspicious of most of the 4,600 Web sites soliciting money on behalf of those victims. Within an hour of the World Trade Center attacks, scam sites popped up on the Web according to ScamBusters.org. At CNN's Impact Your World, you can find a list of list of Web sites of charities highly rated by CharityNavigator.org, an independent, nonprofit organization that evaluates and rates thousands of charity groups based on effectiveness and financial stability. But Web sites are not the only way criminals try to get their hands on charity funds -- they might also send you an e-mail, a letter, phone you or even knock on your door. Here are some tips from the FBI, Scam.Busters and the Better Business Bureau on how to make sure your money goes to people in need. • Be skeptical if someone e-mails you or contacts you through social networking sites claiming to be a quake victim or a government or charity official and asks for donations, the FBI says. Also, the agency says, do not click on any links within those e-mails. And do not click on attached files labeled photos or video because they may contain viruses. • It's OK to be suspicious. Ask for the name, phone number and address of the charity. The American Institute of Philanthropy says honest charities encourage you to know about them and respond to your questions. Also, request that they put the information in writing. • However, do not give them your personal or financial information, because that may leave you vulnerable to identity theft. • Don't be misled by a charity name that "sort of sounds familiar." Scammers may change one word in the title to trick you. • Ask if the charity is registered with any organization and get the registration number. Check for the organization on Web sites such as the Better Business Bureau's Wise Giving Alliance, or Charity Navigator.org. • Ask what percentage of the money you give actually reaches the needy. You also can designate how your donation is to be used. • Don't ever donate cash. Make the check out to the name of the charity, not the person asking for money. And get a receipt with the name of the charity on it. Do NOT give your credit card number to telemarketers or use it on a Web site of a charity you have not checked out. • If the person seeking your donation asks you to give more, that may be a sign that something is wrong. Legitimate charities are grateful, not demanding.